Agriculture Department, Environment Protection Department, Specialized Healthcare and medical Education Department jobs announced though PPSC in latest advertisement. The Punjab Public Service Commission(PPSC) is going to announce 116 jobs with various disciplines across the Punjab for qualified, experts and dynamic aspirants. PPSC is an autonomous body with aim to organize a transparent plate-form and systematic way to recruit best suitable candidates for the concerned position on merit without taking nepotism throughout the process. In this regard, it has designed online system for applying on various positions along with online complaint cell also in order to remove the grievances of candidates with immediate effect. For Agriculture officer (BPS-17), M.S.c (Hons) second division in Agricultural Entomology or plant pathology from a recognized university. For Assistant Director Legal(BPS-17), Law graduate(2nd Division) from a recognized university with 02 years experience. For BIO-Medical Engineer(BPS-17)B.S.c (Biomedical engineering or Biomedical Engineering technology) from a university recognized by higher education commission. To appear in written test and interview only original valid CNIC issued by NADRA will be accepted. No other Identification documents will be acceptable. Applications are advised to read all terms and conditions of the advertisement as well as important instructions as given on this page as well. Applicants should fill in the on-line application form carefully in the light of guidelines and instructions mentioned in the advertisement for the said post and important instructions for candidates. Editing options, to correct any data in the on-line application form will be available to the candidates till the closing date of submission of online applications. Applicants residing outside Pakistan, but having domicile of the Punjab will deposit the fee at the Pakistani embassy of residing country in the currency of that country to the equivalent amount of application/test fee prescribed for the post. 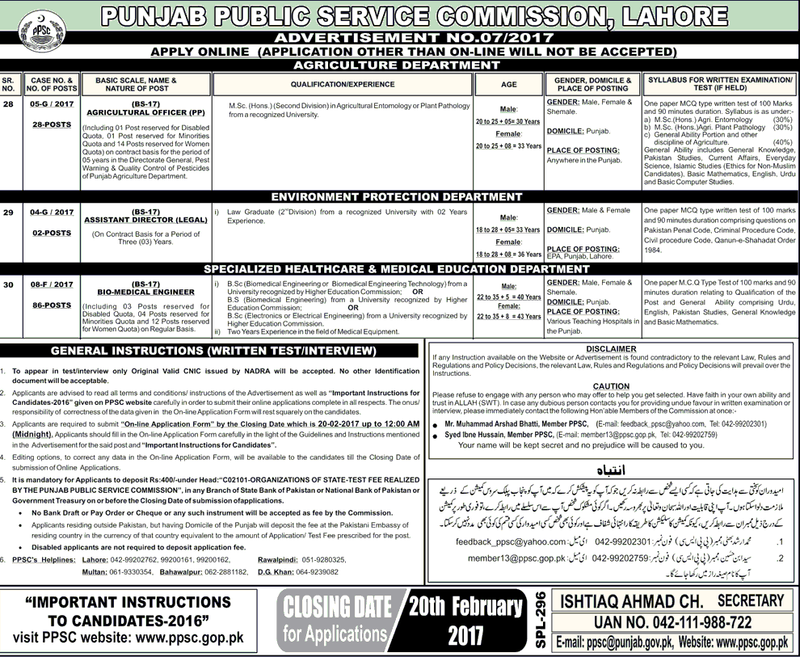 It is mandatory for applicants to deposit Rs:400/- under head;” C02101-Organization of state-fee realized by the Punjab public service commission”. in any branch of state bank of Pakistan or national bank of Pakistan or government treasury on or before the closing date of submission of applications. Applicants are required to submit on-line Application form by the closing date which is 20th February 2019 up to 12:00 am.